Email - how to share? Open and transparent communication is key for efficient collaboration with your colleagues. 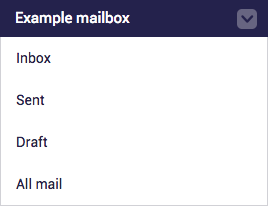 After adding your email account, there are four visibility options. With these options, you can choose how much of your email is visible to colleagues. Group inbox: choose to share the whole Mailbox, so colleagues can send emails from that email address. Really handy for general email accounts such as an 'info@' address. Mailbox will be visible on your colleagues' Email page and also all email communication will be visible in timelines. Public personal inbox: colleagues are only able to read all email communication in timelines of Accounts, Contacts, Deals and Cases. They can't send email from the added email address nor see the full mailbox. This is the recommended option, especially if you and your colleagues are communicating a lot with the same clients. Personal inbox, with shared metadata: email is visible in timelines but subjects and contents are hidden. Colleagues are only able to view date and recipients. They know you've been in touch with a client, but can't read what it's about. A bit more private, but not ideal for smooth collaboration and communication. Private inbox: all email is invisible to colleagues. The go-to option for your private email address or other possible sensitive information. Currently it's only possible to add an email account by using our Gmail integration, click here to read more about that. We strongly suggest to share email with your colleagues, so they can easily follow up on the last conversation you had with a contact. By doing this, Lily will show her true superpowers and helps you be more efficient, open and personal.